Anabond Polyurethane Adhesive are single or two component moisture curing systems that set to form rubber like material of various properties.These are polyurethane silane encapped sealant suitable for construction and automobile applications. It is based on polyurethane prepolymer, which is encapped with amino silane. It is free off free isocyanate content. It is environmental friendly polymer. It has better Paintability than silicone sealants. Anabond 720 is a two component room temp curing polyurethane glossy floor coating for railway coaches. It has hardness of Shore A 85-90. Anabond 7900 is a two component polyurethane fire retardant transformer potting compound. It has hardness of shore D 75-85. 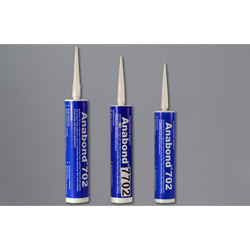 Anabond 797 is a two component polyurethane sealant for low voltage cable jointing component It has very good hot water resistance & very low water absorption of maximum 12 gm/cm2. Anabond 706 / 707 / 708 are two component room temperature curing transparent polyurethane systems suitable for electronic Printed Circuit Board encapsulation. Anabond 794 / 7930 are two component room temperature curing polyurethane adhesive suitable for automotive & Industrial filter bonding application . Anabond Elasto HM 70/90 is a prepolymer for high modulus elastomer application such as Automobile bushes, Wheels, rollers etc. Anabond Elasto LM 80 is a prepolymer for low modulus elastomer application such as , rollers, washers & replacement for moulded rubber components . Polyurethane Adhesive is a kind of adhesive offering a high range of insulating capacity in the application area. They are basically applicable in electrical and electronic industries as sealer or potting purpose. These types of adhesives are also having good paint ability. Apart from the electrical and electronics Polyurethane Adhesive are applicable in wooden substances. Anabond polyurethane one part system are used for bonding, sealing, potting wide range of substrates such as steel, aluminium, stainless steel, ABS, flexible polyurethane, rigid polyurethane, PVC & wood. It possesses good weather ability and excellent mechanical properties. Bonds a variety of similar and dissimilar materials. Used as roof sealing in bus bodies, PCB potting, capacitor potting and also as conformal coating. Looking for Polyurethane Adhesive ?